Wood flooring is any product manufactured from timber that is designed for use as flooring, either structural or aesthetic. Wood is a common choice as a flooring material and can come in various styles, colors, cuts, and species. Bamboo flooring is often considered a form of wood flooring, although it is made from a grass (bamboo) rather than a timber. A number of proprietary features for solid wood floors are available. Many solid woods come with grooves cut into the back of the wood that run the length of each plank, often called ‘absorption strips,’ that are intended to reduce cupping. Solid wood floors are mostly manufactured .75 inches (19 mm) thick with a tongue-and-groove for installation. This process involves treating the wood by boiling the log in water. After preparation, the wood is peeled by a blade starting from the outside of the log and working toward the center, thus creating a wood veneer. The veneer is then pressed flat with high pressure. This style of manufacturing tends to have problems with the wood cupping or curling back to its original shape. Rotary-peeled engineered hardwoods tend to have a plywood appearance in the grain. This process begins with the same treatment process that the rotary peel method uses. However, instead of being sliced in a rotary fashion, with this technique the wood is sliced from the log in much the same manner that lumber is sawn from a log – straight through. The veneers do not go through the same manufacturing process as rotary peeled veneers. Engineered hardwood produced this way tends to have fewer problems with “face checking”, and also does not have the same plywood appearance in the grain. However, the planks can tend to have edge splintering and cracking because the veneers have been submerged in water and then pressed flat. Instead of boiling the hardwood logs, in this process they are kept at a low humidity level and dried slowly to draw moisture from the inside of the wood cells. The logs are then sawed in the same manner as for solid hardwood planks. This style of engineered hardwood has the same look as solid hardwood, and does not have any of the potential problems of “face checking” that rotary-peel and slice-peel products have, because the product is not exposed to added moisture. Wood flooring is a popular feature in many houses. Engineered wood flooring, is composed of two or more layers of wood in the form of a plank. The top layer (lamella) is the wood that is visible when the flooring is installed and is adhered to the core. To give you the look of expensive wood at cheaper costs. The increased stability of engineered wood is achieved by running each layer at a 90° angle to the layer above. This stability makes it a universal product that can be installed over all types of subfloors above, below or on grade. Engineered wood is the most common type of wood flooring used globally. All timber wood floors are made from sawn wood and are the most common category of engineered wood flooring. They do not use rotary-peeled veneer, composite wood (such as HDF), or plastic in their construction. Laminate and vinyl floors are often confused with engineered wood floors, but are not; laminate uses an image of wood on its surface, while vinyl flooring is plastic formed to look like wood. It is difficult to compare solid wood flooring to engineered wood flooring due to the wide range of quality in both product categories, particularly engineered. Solid wood has some limitations. Recommended maximum widths and lengths are typically 5″ / 127mm wide and 7′ / 2100mm long. Solid hardwood is also more prone to “gapping” (excessive space between planks), “crowning” (convex curving upwards when humidity increases) and “cupping” (a concave or “dished” appearance of the plank, with the height of the plank along its longer edges being higher than the centre) with increased plank size. Solid wood CANNOT be used with underfloor radiant heating. However extra care is necessary with the planning and installation of the heating system and the wood flooring, such as limiting the temperature to 85 °F (29 °C), avoid sharp temperature fluctuations, utilizing an outdoor thermostat to anticipate heating demands, and monitoring the moisture content for the subfloor before installation. There are some characteristics that are common to each category: solid wood is more frequently site-finished, is always in a plank format, is generally thicker than engineered wood, and is usually installed by nailing. Engineered wood is more frequently pre-finished, has bevelled edges, is very rarely site-finished, and is installed with glue or as a floating installation. Tongue-and-groove: One side and one end of the plank have a groove, the other side and end have a tongue (protruding wood along an edge’s center). The tongue and groove fit snugly together, thus joining or aligning the planks, and are not visible once joined. Tongue-and-groove flooring can be installed by glue-down (both engineered and solid), floating (mostly engineered only), or nail-down (not recommended for most engineered). “Click” or Woodloc systems: there are a number of patented “click” systems that now exist. These click systems are either “unilin” or “fiboloc” A “click” floor is similar to tongue-and-groove, but instead of fitting directly into the groove, the board must be angled or “tapped” in to make the curved or barbed tongue fit into the modified groove. No adhesive is used when installing a “click” floor, making board replacement easier. This system not only exists for engineered wood floors but also engineered bamboo and a small number of solid floors (such as “parador solido click”) and is designed to be used for floating installations. It is beneficial for the Do-It-Yourself market. Floor connection system: There are a wide range of connection systems, as most of them are mill-specific manufacturing techniques. The general principle is to have grooves on all four sides of the plank with a separate, unconnected, piece that is inserted into the grooves of two planks to join them. The piece used for the connection can be made from wood, rubber, or plastic. This installation system allows for different materials (i.e. wood and metal) to be installed together if they have the same connection system. Wood flooring can also be installed utilizing the glue-down method. This is an especially popular method for solid parquet flooring installations on concrete sub-floors. Additionally, engineered wood flooring may use the glue-down method as well. A layer of mastic is placed onto the sub-floor using a trowel similar to those used in laying ceramic tile. The wood pieces are then laid on top of the glue and hammered into place using a rubber mallet and a protected 2×4 to create a level floor. Often the parquet floor will require sanding and re-finishing after the glue-down installation method due to the small size pieces. Floating installation: A floating installation is where the flooring is laid down in a glueless manner on top of a layer of underlay. The individual planks are locked together, and are not glued or nailed down to the subfloor. By doing this the floor is floating above the underlay, and can be laid on top of existing tile or marble, without the risk of damaging the subflooring. The two most popular modern finishes for wood flooring are oil-modified urethane and water-based polyurethane. Within both categories there are many variations and other names used to describe the finish. Oil-modified urethane and water-based polyurethane also have very different refinishing and maintenance regimes. Natural shellacs, lacquers, and varnishes were used in the past, as were waxes, often blended with oils. 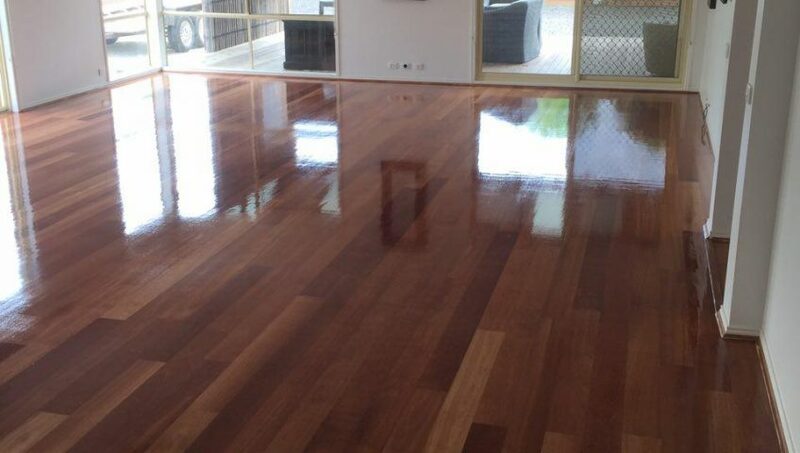 Oil – Oiled floors have existed for several thousand years and is the most common floor finish used globally. Oil finished floors are made from naturally derived drying oils, and are not to be confused with petroleum based oils. Pre-finished oil floors can be UV cured. Most vegetable based oils are 100% natural and contain no VOCs.Brushed and oiled – Steel brushes are used in the direction of the grain which opens up the surface of the wood and removes splinters. The wood is then oiled. Polyurethane – Polyurethane floor finishes were first introduced around 1942. There are several types of polyurethane finishes that exist, but the two most common are oil-modified polyurethane and water-based polyurethane. Water-based urethane is harder than oil-modified polyurethane and is much safer for the user. Generally, hardwood floors need to be buffed every 3–5 years. The process usually takes about one day. Buffing refers to the process of using a stand up floor buffer. The floor is abraded with 180 grit screen on the buffer. This allows for the new coat of finish to mechanically adhere to the floor. This process works with great results as long as the floor hasn’t had any waxes or synthetic cleaners. Sanding the finish off old wood floors and smoothing them out. Sanding provides a method for smoothing an installed floor, compensating for unevenness of the subfloor. Additionally, sanding is used to renew the appearance of older floors. Sanding using successively finer grades of sandpaper is required to ensure even stain penetration when stains are used, as well as to eliminate visible scratches from coarser sandpaper grades used initially. Prior to modern polyurethanes, oils and waxes were used in addition to stains to provide finishes. Beeswax and linseed oil, for example, are both natural crosslinking polymers and harden over time. ^ Taylor, Adam M. (2003). “Bamboo Flooring: Better than wood?”. University of Tennessee. Retrieved 6 March 2012. ^ Great Floor Sanding (2015). “Wood Floor Finishes”. Retrieved 2015-03-26. ^ Field, Anne. “Wood Floors and Finishing”. Michigan State University. Retrieved 6 March 2012.